I absolutely love to run, one day I would like to run a marathon. I have been running for 5 months, yet it's still hard to go for long distances. On the treadmill I can run for about 5 minutes until I have to walk. I don't understand why it's still this hard for me to run for longer periods of time without stopping. I would really like some help here! I don't want to stop running, it just seems like I can't get any better at it and it's discouraging. By the way, I'm a 20 yr old female, 5'7" 165 lbs. One of the first questions I have got is how fast you are running. Most of your running should be done at easy pace, also known as conversational pace. That's the pace at which you'd be able to have a conversation if you were running with someone. From what it sounds like it could be that you are running way too fast. And then it is not so strange that by about the five minute mark you need some time to catch your breath. Even then, all good things need time. When you are getting really worn out in your workout it is quite okay to take a walking break. After a few minutes of walking, give it another go. And that's where the secret lies. Just doing that little bit more after you couldn't do any more. It's the whole foundation of my Beginner Running Programs. Start off with only a few minutes of running, take those walking breaks and build it up each time with just adding a minute of running here and there. If my first bit of advice about your running speed does not work enough, then head over to my Beginners Running Program 3. I am not suggesting you should start all the way at the beginning. But pick the week that seems to fit best with your current ability and go from there. 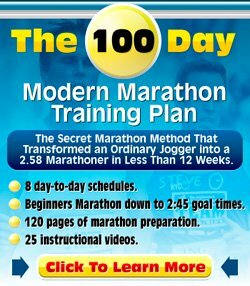 This running program is by far the most popular. Almost on a weekly basis I get enthusiastic e-mails from people saying that they can't believe they have finished the program and are now able to run 30 minutes consecutively. Give it a go as well, I hope you'll be pleasantly surprised as well!